The Lotus Notes to Google Apps Converter allows the user to transfer multiple Notes files to Google Apps at once. 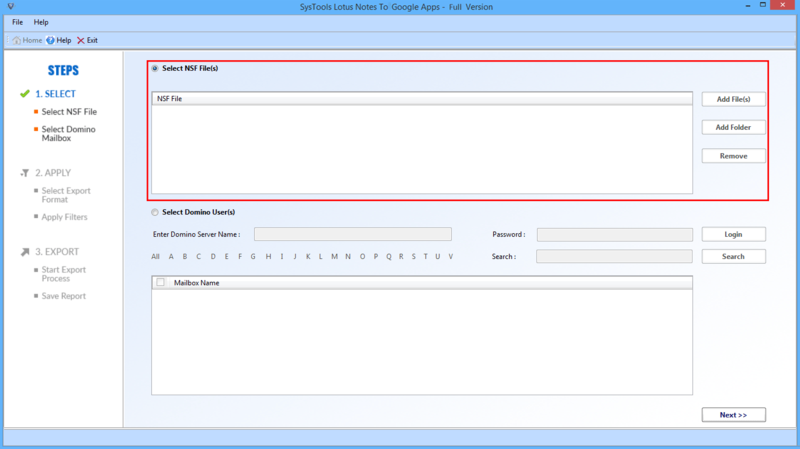 In addition, one can import a CSV file also containing the list of Google Apps user account against NSF files path for direct mapping in bulk. Transferring of contacts and calendar items from each Lotus Notes NSF to G Suite is also possible. The user can map specific files with desirable Google Apps user accounts while migrating Lotus Notes applications to Google App. By this way, the user would be able to export Lotus Notes to G Suite of the respective users’ account. 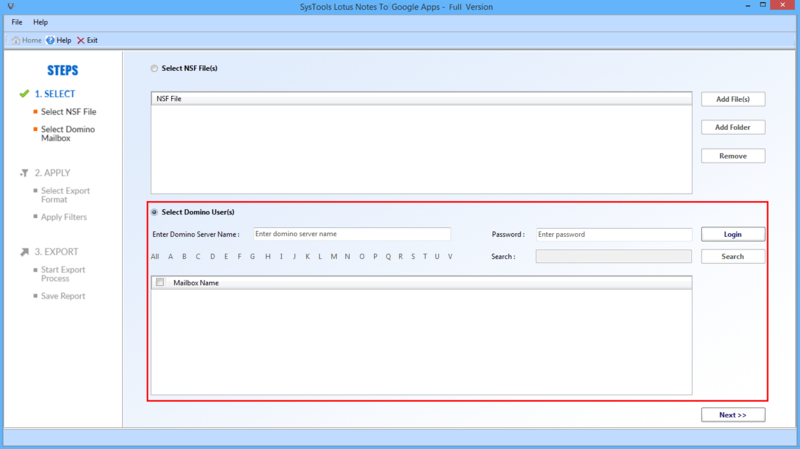 For this, you just need to provide the Google Apps username in the field mentioned against the respective NSF file. During Lotus Notes to Google Apps migration, there is number of filters offered by the software. A user can set a date range that will export only that emails, contacts, and calendars, which comes under the specified range. In order to apply this filter, one just needs to provide ‘To’ and ‘From’ details and it will migrate data within that range. 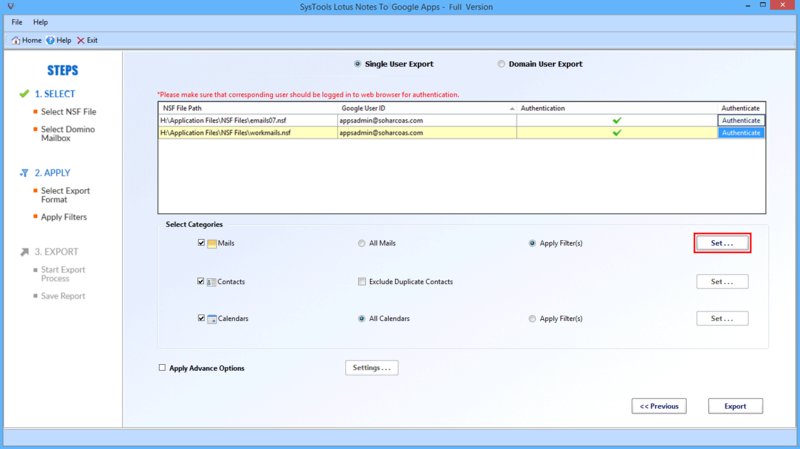 Another major feature offered by this software is that it provides an option to exclude duplicate contacts migration to G Suite account. If a user wants so, then simply check Exclude Duplicate Contacts option while selecting the filters. In this way, it becomes easy for the users to prevent unnecessary data migration and fasten up the process. The Lotus Notes to G Suite Converter allows users to resume the export process from the same point where it was paused. This feature is helpful in cases whereby mistake the application gets closed or interrupted in between. It displays the history of previous G Suite migration for IBM Notes as the software is relaunched. As the conversion of NSF files begins, the Lotus Notes files to G Suite Converter show you the real-time progress report including all conversion details. For example, the Username, number of emails, contacts, and calendars being exported, any errors in the process and speed of migration are shown. To run the software, go to Start menu >> Programs >> Lotus Notes NSF to G Suite. Choose Select NSF file(s) radio button to add single or multiple NSF files as per your requirement. Choose Select Domino radio button to connect with the Domino Server and select the users via Admin Login. Click on the Add File(s) button to upload the NSF files and Browse to choose the desired NSF file. 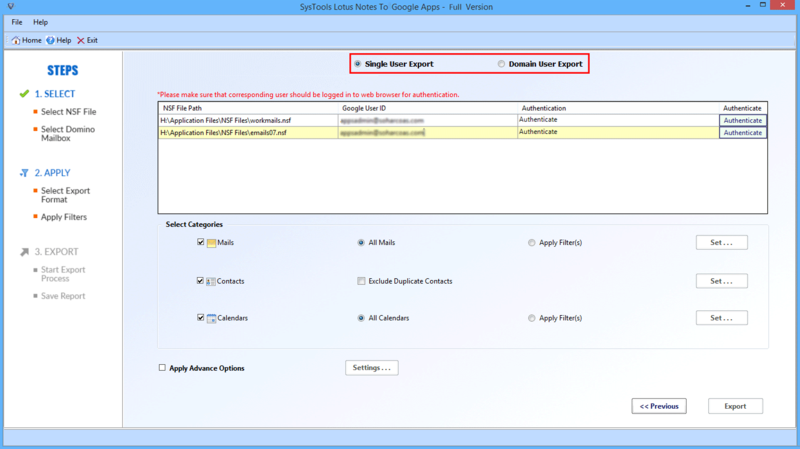 Click on the Next button and choose Single User Export to export the NSF files to a single Google Account or select Domain User Export to export NSF to a Google Apps Domain-based account. 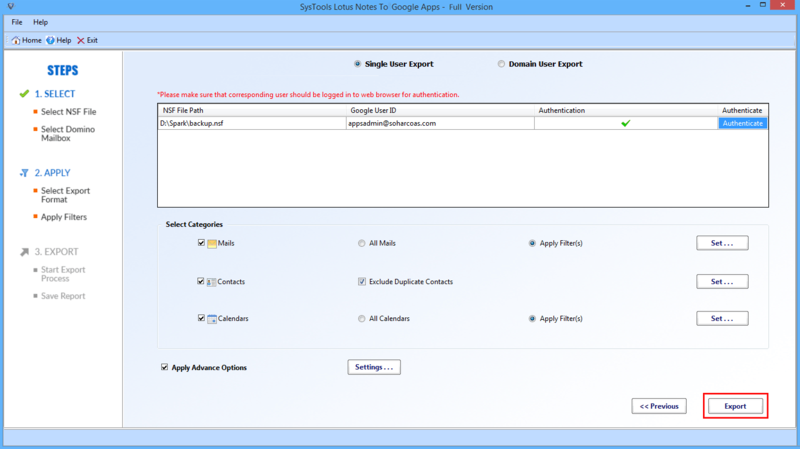 Add the users Google ID and click on Authenticate to start the account verification process and allow access to the software. After authenticating, select the categories, apply filters and set the range according to which you want to migrate the data. To Apply Advance Options, check the box and click on the Settings button. Choose the desired settings for the conversion process. 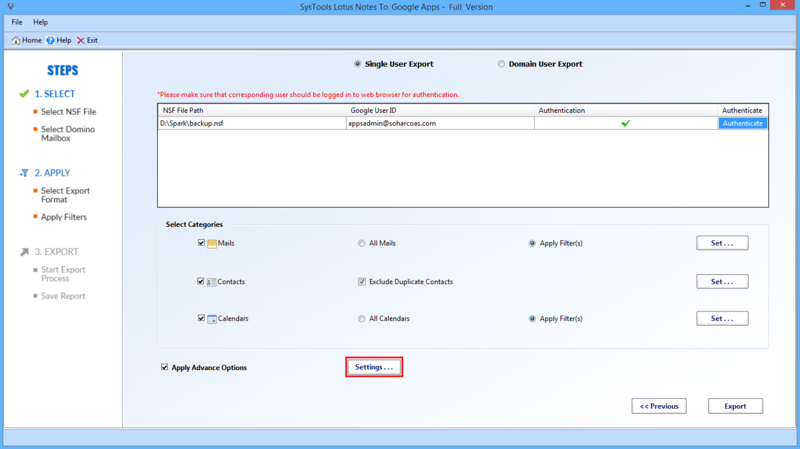 Click on Export button to start the G Suite migration for IBM notes. The tool displays the real-time progress report of the conversion process. 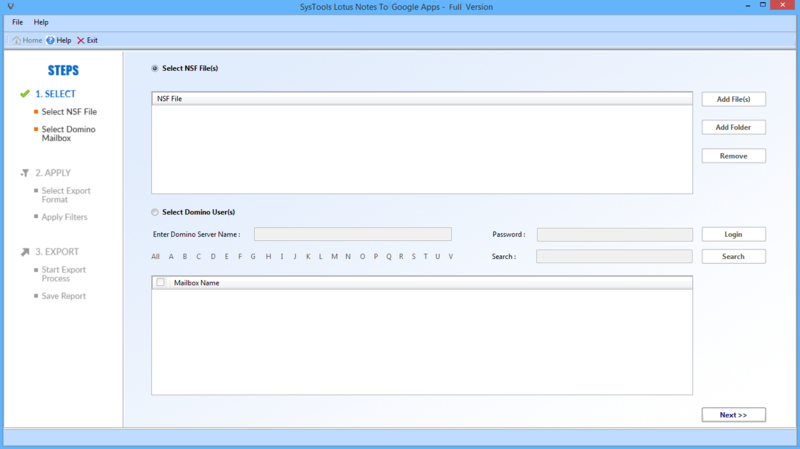 Can I transfer all data items from Lotus Notes to G Suite using this converter? Yes, the tool allows you to migrate all data items like emails, contacts, and calendars from Lotus Notes to Google Apps without providing any trouble to the user. What are the prerequisites for using this Converter? 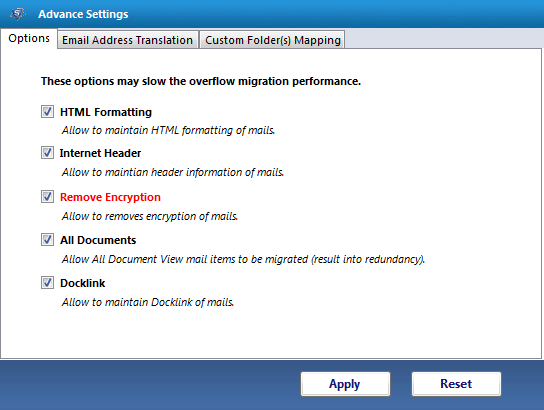 Lotus Notes email client should be installed and configured on the performing machine. You must have the administrative privilege of the Google Apps account to which you are migrating NSF database. Is bulk NSF file migration possible with this Software? 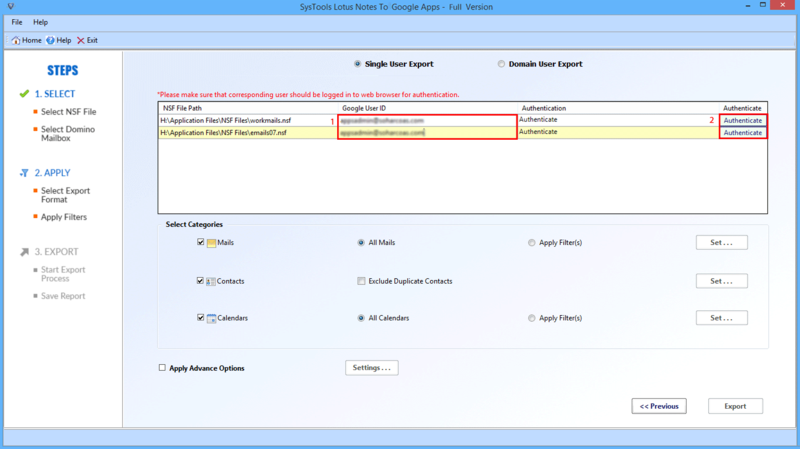 Yes, you can migrate multiple NSF database files to a Google Apps account once. Is the folder hierarchy maintained after Lotus Notes to Google Apps export? Yes, the folder hierarchy of NSF database will be maintained even after migrating Lotus Notes applications to Google Apps. 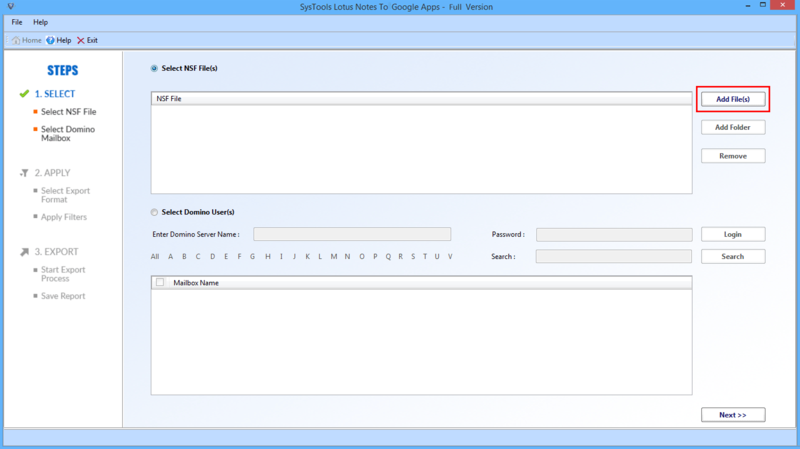 Can I export Lotus Notes contacts to Google Apps using this converter? 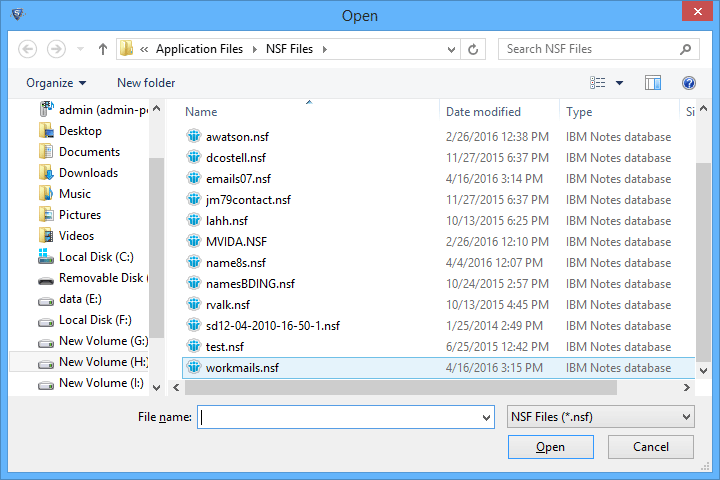 Yes, the Lotus Notes Converter helps you to export emails, contacts, and calendars from Lotus Notes NSF files to Google Apps. Can the software convert files from all versions of Lotus Notes? Yes, the software can convert files from all versions of Lotus Notes.